Where are SA’s gay surfers? It's time to start questioning the ying and yang of gender in South African surfing. I’ve been surfing in Cape Town with a woman surfer who is openly lesbian but, to my knowledge, I have not shared waves with a gay male surfer. What is it that has made South African surfing so homophobic that gay men do not readily “surf out” in the line-up? While South African competitive surfing in the past has been somewhat tolerant of women surfers coming out, any questioning of a male surfer’s sexual preference has been, and remains, closely patrolled by the surf media and industry to be shown as hetrosexual. Youthful surf fashion, it seems, cannot allow for gender slippages. 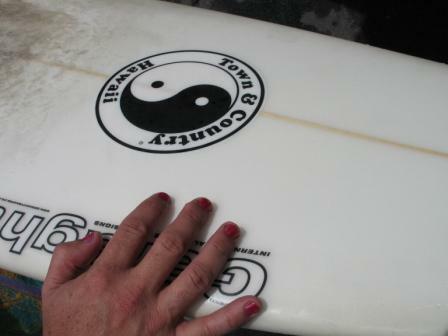 Nevertheless, this is not just a South African trend as globally there is an unspoken homophobia within surfing circles. In looking for answers in writing a gendered history of surfing culture in South Africa – one that is critical of how the idealised images of hetrosexy boys and girls have come to be the normal way of representing surfers – I was recently directed to a link to a gay surfer online resource that was advertised in a German surfing magazine. Gaysurfers.net (which can also be found as a Facebook group) aims to foster a gay surfing social network as well as provide a site for creating awareness of the need to fight homophobia in the surf by encouraging tolerance of gay surfers at local breaks. In “Surf’s Out“, a story published in DNA, an Austalian gay men’s magazine, in June of this year, Nick Cook writes of how membership of the Gaysurfers website has grown (to date there are 1,500 members globally). He also profiles some of the men who have come out, their attitudes to surf culture, and their reflections on why they think surfing is anti-gay. Another article entitled “Queer Waves“, published last week (23 June) on the Australian online surf media site Swellnet by Dr Clifton Evers (a cultural researcher at the University if New South Wales), confirms many of the trends noted in Cook’s article despite the fact that surf culture encourages male-bonding but not male desire among surf buddies: “The policing of male-to-male social bonding and mateship in surfing is common, and is due to an ever-present undercurrent of homophobia.” Evers calls for straight surfers to stop being silent on the issue of homophobia – he notes that that silence makes one complicit in the exclusion of gay surfers from local surfing communities. The two films noted by Evers – Tan Lines (2006) set in Australia and Shelter (2007) set in California – are worth watching (you will be able to find them in local indie DVD stores) and go far in highlighting that gay men surf despite the ostracism and denial so pervasive in surf culture. Its time for a similar South African production since I do not think the forthcoming Blue Crush 2 movie will be introducing a gay surfer into the storyline.